This stainless steel pair of forceps has a length of 23 cm, and has been developed for the handling of plantlets in Plant Tissue culture. The risk of contamination is lowered because of the long, thin extended legs, which increases the distance between the researcher's hand and the sterile plantlets and culture vessel. 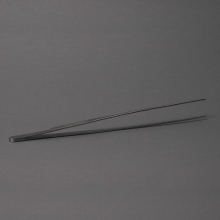 The long thin legs of this pair of forceps allows easy maneuvering in long narrow culture tubes and the bottom of the tube can be reached without contacting the sterile rim of the tubes. The forceps are also light and require only slight pressure to close, thereby giving the forceps a fine ergonomic performance without fatiguing the hand.